In support of Operation Enduring Freedom, the B-2 flew one of its longest missions to date from Whiteman to Afghanistan and back. 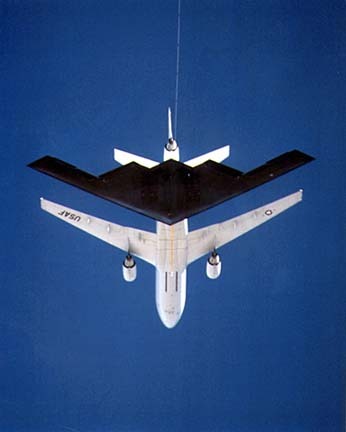 Along with the B-52 and B-1B, the B-2 provides the penetrating flexibility and effectiveness inherent in manned bombers. Its low-observable, or "stealth," characteristics give it the unique ability to penetrate an enemy's most sophisticated defenses and threaten its most valued, and heavily defended, targets. Its capability to penetrate air defenses and threaten effective retaliation provide a strong, effective deterrent and combat force well into the 21st century. The first B-2 was publicly displayed on Nov. 22, 1988, when it was rolled out of its hangar at Air Force Plant 42, Palmdale, Calif. Its first flight was July 17, 1989. The B-2 Combined Test Force, Air Force Flight Test Center, Edwards Air Force Base, Calif., is responsible for flight testing the engineering, manufacturing and development aircraft as they are produced. .
Whiteman AFB, Mo., is the B-2's only operational base. The first aircraft, Spirit of Missouri, was delivered Dec. 17, 1993. Depot maintenance responsibility for the B-2 is performed by Air Force contractor support and is managed at the Oklahoma City Air Logistics Center at Tinker AFB, Okla.. The success of the B-2 was proved in Operation Allied Force, where it was responsible for destroying 33 percent of all Serbian targets in the first eight weeks, by flying nonstop to Kosovo from its home base in Missouri and back. In support of Operation Enduring Freedom, the B-2 flew one of its longest missions to date from Whiteman to Afghanistan and back.. The prime contractor, responsible for overall system design and integration, is Northrop Grumman Integrated Systems Sector. Boeing Military Airplanes Co., Hughes Radar Systems Group, General Electric Aircraft Engine Group and Vought Aircraft Industries, Inc., are key members of the aircraft contractor team. Another major contractor, responsible for aircrew training devices (weapon system trainer and mission trainer) is Hughes Training Inc. (HTI) - Link Division, formerly known as CAE - Link Flight Simulation Corp. Northrop Grumman and its major subcontractor HTI, are responsible for developing and integrating all aircrew and maintenance training programs.